There are times that we need to transfer PDF file to word format for further editing. Manage PDF content in Microsoft Word is not a hard task, but you have to use the converter that is able to convert PDF to word to meet your needs. For Mac users, they should choose Mac PDF Word converter to finish the task. - Concise and clear program interface. - Easy operation: Add PDF > Choose out put format > Convert. 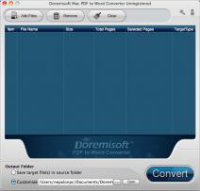 - Comprehensive and economical Mac PDF Converter. - Support convert PDF to EPUB, Text, HTML, Image and SWF format too. - Convert encrypted PDF files to Word documents on Mac. - Specify page or page range from original PDF file for conversion instantly. - Support batch conversion which saves you a lot of precious time. - Advanced settings help to customize the output converted file. - Preserve the original layout of text, columns, graphics after conversion. - Support PDF files in English, German, French, Korean, Latin, Turkish, Italian, Chinese, Japanese, etc. - The interface of this PDF to Word for Mac is extremely simple. - Support drag-and-drop operation. Mac users can easily add or remove PDF files in and out of the panel, or change the conversion order for the imported PDF files by dragging and dropping. - Convert PDF to Word and preserves all text, images, layouts, hyperlinks, tables and graphics with high accuracy. - After conversion, Mac users can easily edit PDF files or reuse the contents in other applications. - Convert up to 50 PDF files at one time. - Extract specific pages from large PDF files instantly. - Simple operation: run the program - add PDF files - click the 'Convert' button, the whole conversion will be done within seconds. - Support two output formats: PDF to Word and PDF to Text. 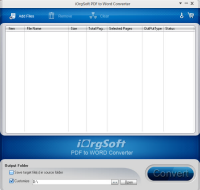 Save money to pay for another PDF to Text converter on Mac. - Output quality is good, all contents like text and layouts, tables, graphics and hyperlinks will be preserved exactly from PDF to Word on Mac. - Preserve the layout, including paragraphs, columns, tables, and margin perfectly with its intuitive and user-friendly interface. - Support two partial conversions: one can import multiple PDF eBooks to the program without limitation of PDF pages and convert them to Word Doc document at one time or Customize the page ranges of each PDF eBooks in the panel for conversion then split a large PDF eBook to small Word Doc file for easier editing. - Stand-alone programe which can convert PDF to Word Doc without Adobe Acrobat Reader or Microsoft Word installed! - Support batch convert PDF to Word documents on Mac. - The original PDF elements such as text, images, etc can be preserved in the converted Word files. 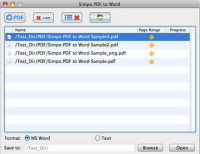 - After conversion, one can easily reuse, extract or modify the contents of PDF in your Word on Mac. - Several clicks are enough to do the PDF to Word conversion. - Convert certain pages of a large PDF file by setting partial conversion. - Convert Encrypted PDF files on Mac Owner Password: Convert PDF to Word on Mac directly. User Password: Enter password and convert PDF to Word Mac. The mentioned PDF converters listed above can help Mac users to convert their PDF file to word format, but if you would like to convert PDF to other formats like EPUB, image, SWF, PPT, Text, you should find other Mac PDF tools for help. The new released PDFMate PDF Converter for Mac would be a great help for Mac users who want to convert PDF to different formats in one tool! Would like to convert PDF to word on windows? You can find these windows version PDF word converters here.